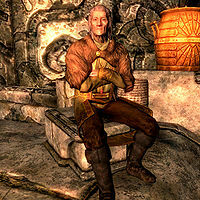 Raerek is an elderly citizen who lives in Markarth. He is the steward of Jarl Igmund, who rules from Understone Keep. He is also Igmund's uncle and assists him running his administration. A house may be purchased from Raerek after retrieving a shield for Jarl Igmund. If the Stormcloaks take control of Markarth and Raerek has been replaced by Reburrus Quintilius, you can then find him in the basement of the Blue Palace In Solitude. He wears a set of fine clothes and a pair of fine boots. He is equipped with an iron dagger, and carries a selection of upper-class loot and gold. Due to the name and function (a stamina potion) of the Stallion Potion, and him thanking you for your discretion upon delivering it, it can be inferred Raerek has some sort of embarrassing bedroom malady. After initially inquiring about the house for sale, if you do not have enough gold, the option is then erased and Raerek will spout canned dialogue. This can be fixed using the console command setstage favor250 20, then talking to the jarl. He will make you a thane, and Raerek will then allow you to purchase the house. Raerek may comment "I don't think we have anything to discuss, Stormcloak." even if you haven't joined the Stormcloaks, and the city's turnover has been caused by Season Unending. Mod Notes: Only GovExiled faction is checked. This page was last modified on 26 October 2013, at 04:00.